The larvae, which feed on a variety of plants including Calophyllum inophyllum, Cupaniopsis anacardioides, Hibiscus tiliaceus and Syzygium tierneyanum, are attended by green tree ant, Oecophylla smaragdina. Mature larvae pale green with broad brownish bands plus cream lines and a yellow patch: head pale brown. 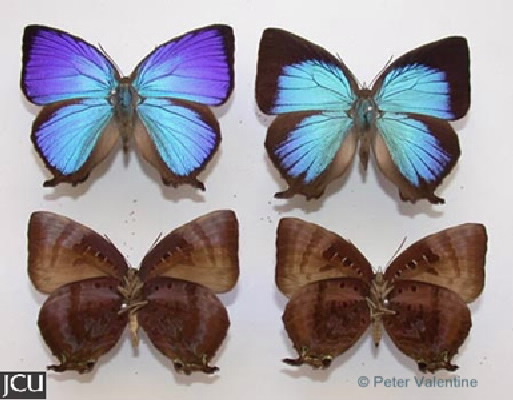 Adults shining iridescent blue to greenish-blue, outer margins black; hind with a distinctively curved black tail; lower surface various shades of brown with a variety of darker bands and spots.